This is a rarely seen annual in British gardens…which seems odd as it’s drop dead gorgeous and a piece of cake to grow. It’s not just the wonderful velvety, trumpet flowers that smother the whole plant in profusion but you will see it has a lime green five pointed star in its centre…this is a very ‘wow’ flower. It even looks fantastic when it goes to seed and produces heaps of lantern like pods. …and it lasts up to ten days as a cut flower. Oh…and one last thing…it’s a tetraploid…yes…I knew that would clinch the deal. 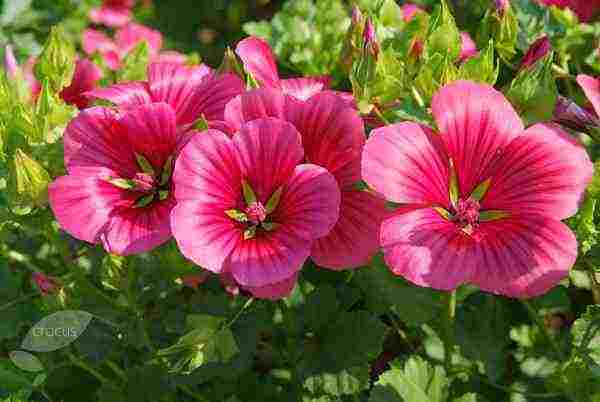 Sow Malope ‘Vulcan’ seeds in March undercover or mid April outside.